The performance of Ulta Beauty over the past half-decade is staggering. The largest beauty retailer in the US continues to produce ridiculous levels of growth. In 2016, net sales increased 23.7% to $4.85 billion, effectively adding a billion in sales on top of the three-quarters of a billion (up 21%) Ulta added in 2015. Comp sales? Up 15.8% (bettering 2015’s 11.8% gain). And store growth is one part of this equation. Expect another 100 new stores in 2017. Ridiculous. 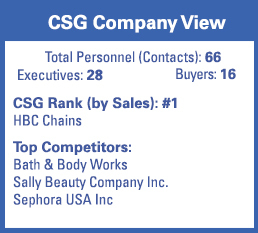 Source: Chain Store Guide’s Drug Store & HBC Chains Database. *CSG projections based on proprietary analysis and company statements. Actual figures are subject to change. This data is not intended for investment decisions.